Diamond in the rough just waiting for some TLC. Carpet removed and oak flooring just waiting for refinishing. Walls are paint ready waiting for your paint selection. Covered front porch, living room with fireplace with gas logs, eat-in kitchen with oak cabinets and appliances, 2 bedrooms, hall bath with tub/shower, office or 3rd bedroom with access to bath with shower stall and laundry closet, screened porch and open decking for relaxing, carport for vehicle storage, outside storage provided under screened porch, in basement and in a storage barn, HP and insulated windows already installed. 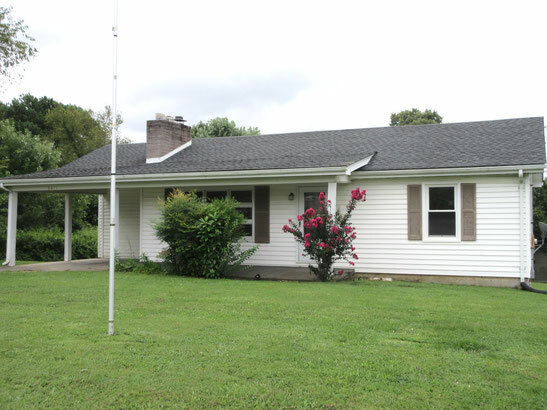 Located just outside City limits so close to all amenities.